My trip to Charlottesville, my first stop on the way to Bedford for the Commemoration of the 70th anniversary of D-Day, has been an adventure unto itself. Just north of Winchester on I-81 an electronic sign warned me that the interstate was “blocked” 24 miles further south. “Blocked” and “interstate” are two words that never belong in the same sentence, and so I decided to head to Berryville and Route 340. Today was a beautiful day for a drive, but I was more interested in speed than in beauty, because I wanted to get to Becky and Jesse’s apartment in Charlottesville to ice my foot. I needed to ice my foot because in my seasonal position as a plant merchandiser at the Spring Mills, WV Wal-Mart, I caught my heel under a rolling flower cart at the exact moment when my big toe was bent. As a whole, the toe, therefore had no give, but apparently lots of little parts inside it gave and it stiffened and swelled some as the day wore on. In any case, I stopped at the Walgreens just off the I-81 exit on Berryville Pike for a pick-me-up iced tea. 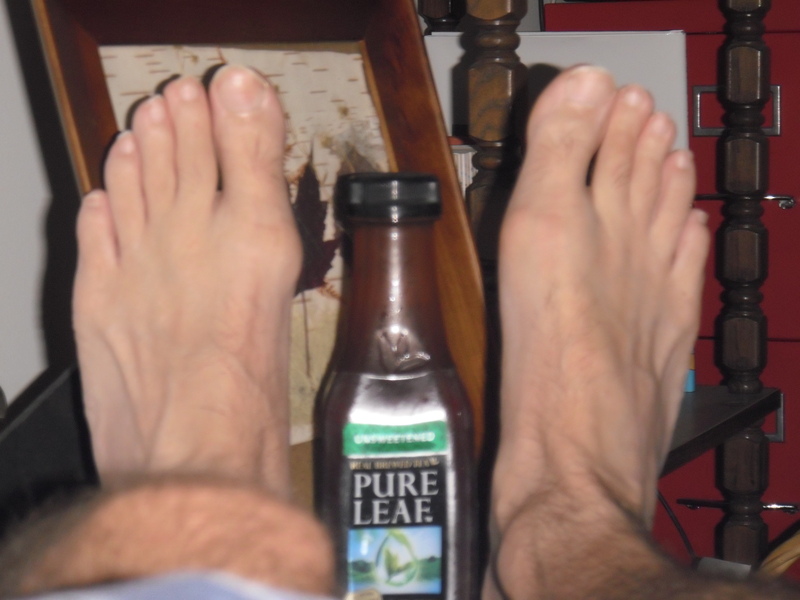 I got two bottles of Pure Leaf Unsweetened Tea and took the first cool sip. It immediately occured to me that I actually didn’t know what kind of “pure leaves” were used; based on the taste, I’d say it was stinkweed. This trip was definitely not off to a good start. Still, the sky was bright and the mountains beautiful, so I took a deep breath and sat back to enjoy the ride. Of course, Route 340 has half again as many numbers in its name as it does actual lanes. I passed Gun Barrel Road right before I got to Dinosaur Land which is at the corner of Lord Fairfax and Stonewall Jackson Highways. If there is a more Virginia-sounding intersection anywhere in the Old Dominion, I’d like to hear about it. From left to right: My good foot, formerly my bad foot until this morning; the world’s worst iced tea; my new “bad” foot, already feeling better thanks to the healing powers of pulled pork barbeque. I entered Front Royal where the 340 “bypass” goes right through town. In fact, it might loop around Front Royal several times considering how long it took to clear the town, on the south side of which was a construction zone. Just past Poor House Road, traffic had come to a stop. Had there been a Crazy House Lane, I would have taken that and checked in for the night right there. But the sky was clear and the mountains beautiful and we soon started moving again. Just as I crossed over–and I’m not making this up–Gooney Creek. I spied a dump truck full of rocks. Attached to the back was a big orange sign that read, “Work Vehicle: Do Not Follow.” I cannot imagine who thought this sign would be helpful. A mannequin, perhaps. South of the town of Shenandoah, I crossed over “Naked Creek.” I passed the next 20 miles pleasantly imagining how this brook was christened. I finally made it to Becky and Jesse’s in about a forever and 21 minutes. I would have stopped and taken a photo of the clear sky and the beautiful mountains, but that would have taken a forever and 22 minutes. Hobbes greeted me at the door and Becky got me an ice bag. We headed to Belmont barbeque for dinner where the “Belmont Slop Bucket” is a specialty. The Slop Bucket consists of cheesy potatoes on top of which are baked beans on top of which is pulled pork on top of which is cole slaw. Almost immediately I could feel that North Carolina vinegar-based barbeque sauce racing right to my injured foot. I need not explain the healing properties of North Carolina vinegar-based barbeque sauce. Tomorrow morning it is on to Bedford. I hope you’ll come along with me via this blog. Maybe your presence will make for a smoother ride. This entry was posted in Uncategorized and tagged 70th Commemoration of D-Day, Bedford VA, Belmont Barbeque, Charlottesville, injured toe, Interstate 81, Route 340. Bookmark the permalink. I hope the rest of your trip involves uneventful travels but lots of great memories! Thanks! It’s already full of interesting memories. And barbeque. Austin … you poor thing! You DID have some kind of day! … and you absolutely know why I’ll never forget D-Day! Happy birthday, Bonnie! It was indeed, a day. I just hope the swelling is out of my toe by next weekend! Thanks, Anais, I wouldn’t have been much use on the dance floor this weekend. Now I really feel bad and responsible for your misfortunes because I not traveling along with you. Hang on there brother and be safe. I sure could have used my trusted navigator and co-adventurer!